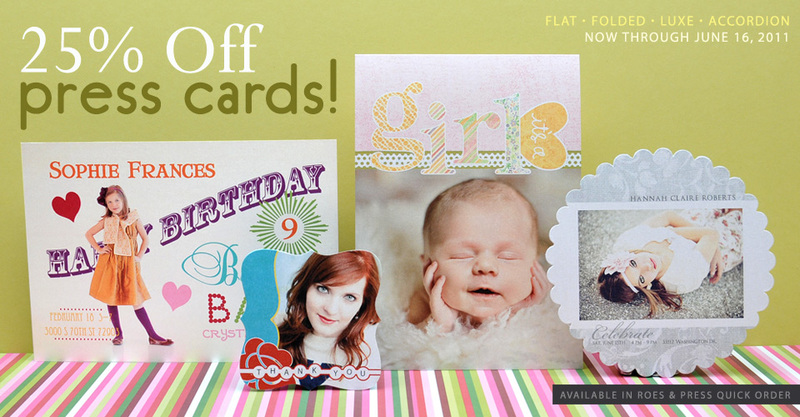 Now through Thursday, take 25% OFF all Press Cards, including Flat Cards, Folded Cards, Accordion Cards, and Luxe Cards! All press paper types, including Smooth, Linen, and Pearl will be discounted, however, Gloss and UV Coating are not included in the sale. Rounded corners and envelopes (with or without return addresses) will also be billed at full charge. Place your orders in ROES or Press Quick Order. Sale ends at midnight (Central) on Thursday, June 16, 2011. Are Business Cards and Rep Cards included in the sale? No, Business Cards and Rep Cards are not included. The sale price is not reflected in my ROES order summary or email confirmation. Am I really receiving a discount? The sale price will not be shown in the ROES order summary or in your e-mail confirmation. This discount will only appear after the order is transmitted and received by the lab. Please note, there are no order summaries included in Press Quick Order. I placed a Press Card order just prior to the start of the sale. Can I receive a credit? Unfortunately, any Press Cards ordered prior to the start of the sale will not be credited. My order total is less than the $15 minimum charge? What amount will be invoiced? Minimum order charges will remain throughout the duration of the sale. Any order total that falls under the minimum charge will be rounded up to $15. If I place an order for press cards in Remote Studio, will I receive the discount? Yes, Flat Card, Folded Card, and Accordion Card orders placed in Remote Studio will be discounted. Luxe Cards are not available to order in Remote Studio.